The fact that Vivek Oberoi, who plays the lead role, may have political views that align with the BJP, and that the film was completed in record time, is no reason “to jump to the conclusion” that it is political propaganda, the producers said. 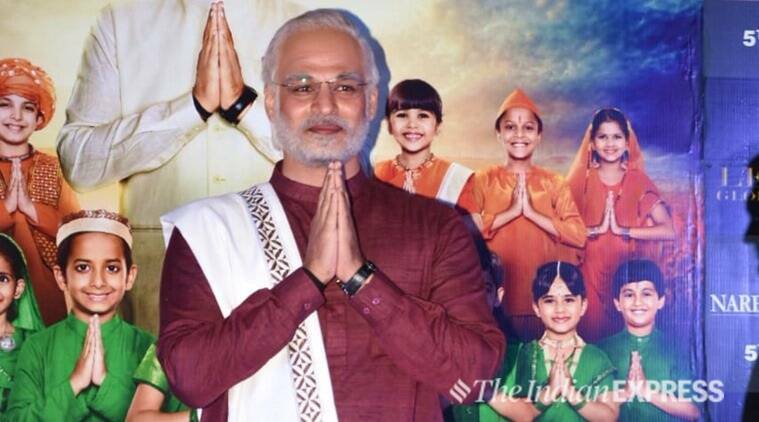 Responding to the Election Commission’s notice Thursday, the producers of PM Narendra Modi, a biopic of the Prime Minister, have denied any link with the BJP and said they had “put in their personal money for the making” of the film. Incidentally, Jain, a partner at Parinam Law Associates, is also a shareholder and director of BlueKraft Digital Foundation — the “technology and knowledge partner” for Exam Warriors, authored by Modi and released last year. According to the Ministry of Corporate Affairs’ records, Jain owned 50 per cent of the shares in BlueKraft as on March 31, 2018. On March 2 this year, BlueKraft released another book, Mann Ki Baat – A Social Revolution on Radio, 50 Episodes Special Edition, a compilation of Modi’s Mann ki Baat radio programme. This was BlueKraft’s second book on Mann ki Baat, the first was released in 2017 at Rashtrapati Bhavan. Last year, BlueKraft also released a series of videos, titled Yoga with Modi. Speaking to The Indian Express, Jain said he is an “independent lawyer” and “BlueKraft has nothing to do with this”. He said he is a director in many companies and represents “anybody and everybody in this country” as a lawyer as that is his “independent profession”. “Am I also restricted from dealing with the matters,” he asked. Jain said BlueKraft has “no link to the government”. Exam Warriors was authored by Modi “in his independent capacity”, he said, and “it was not a Government of India book”. In his reply to the EC, on behalf of the film’s producers, Jain said the biopic was “produced by our clients and not any political candidates”. “The said film has been made as a commercial venture by our clients and other producers who are from the film industry. If a producer who is producing a movie relating to a political figure and/ or political party is presumed (to be) having a political nexus, then every movie made in India involving political leaders (past and present) will be identified as a propaganda movie,” he said. They said they asked Maharashtra Chief Minister Devendra Fadnavis and BJP president Amit Shah to promote the film as they wanted it to be a “resounding commercial success”, and also because Shah has a character based on him in the film. Any order to ban or delay its release, they said, would “adversely affect the democracy and rule of law” on several counts. They said freedom of expression “cannot be held to ransom by anyone, especially a rival political party”. The EC sought an explanation from the film’s producers following a complaint filed by the Congress, asking the poll panel to delay the release of the biopic. Terming the Congress’s complaint as “baseless, frivolous and mala fide in nature”, the producers said they should be allowed to release the film on April 5. He said films like Mere Pyare Prime Minister, Uri – The Surgical Strike, and The Accidental Prime Minister, “which also dealt with equally if not more sensitive topics and issues”, were allowed to be released and are still running in some halls. This demonstrates the “arbitrary” nature of the Congress’s complaint, he said. These films were released before the Model Code of Conduct came into force.